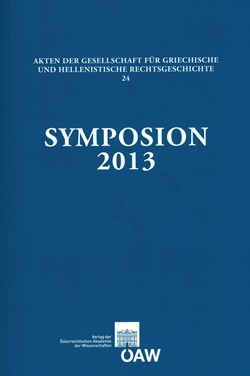 The 19th Symposion of the International Society for Greek and Hellenistic Legal History took place in Cambridge MA, August 26–29, 2013. 15 papers were presented, and respondents opened the discussion about every paper. The papers and responses are collected in this volume. They begin with broad looks at Greek law overall, followed by archaic Cretan law, the law of classical Athens, epigraphic evidence from other poleis of Hellenistic and Roman times, legal papyri, and law in later Greek literature. The Symposion supports the cooperation of legal historians with those studying all aspects of Classical Antiquity allowing the participants a free choice of topics from their current areas of research.